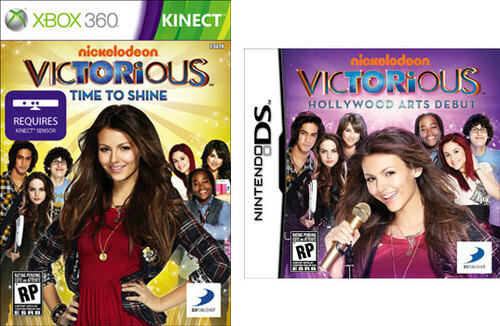 Victorious™: Time to Shine and Victorious™: Hollywood Arts Debut are the first video games based on Nickelodeon’s hit live-action comedy television series, Victorious. Each game offers players the chance to interact and fully experience life in the elite, Hollywood Arts world as a new student in two completely unique and fun ways. Victorious: Time to Shine on Kinect™ for Xbox 360® lets players become the star of their own Hollywood Arts production, not only singing and dancing on stage, but also acting in their very own music video to hit songs from the show. In Victorious: Hollywood Arts Debut for the Nintendo DS™, players will experience a full year as a new student at Hollywood Arts and take part in crazy adventures while becoming friends with Tori and all the stars from the show. Victorious™: Time to Shine and Victorious™: Hollywood Arts Debut are available Tuedsay November 15, 2011!